On a busy weeknight, my family loves these hearty Grilled Veggie Sandwiches. They’re packed full of smoky grilled vegetables like eggplant, onion, romaine lettuce and red peppers. A slathering of hummus and pesto take the flavor of these speedy sandwiches over the top! Even though Summer is on it’s way out, I have no intention of putting my grill away anytime soon. Our grill stays active well through the fall and it’s one of my favorite ways to cook a quick and simple dinner, even on a weeknight. Especially when the meal can be made entirely on said grill. We’re deep into our second year with our CSA and I love the range of vegetables that we receive. I’ve come to rely on our CSA box to deliver us endless healthy options and really pack our diets full of wonderfully exciting produce. These grilled veggie sandwiches are a wonderful way to use up some of your extra veggies and can easily be customized to fit your family’s tastes. And if you’re worried that a veggie sandwich won’t fill you up, have no fear. 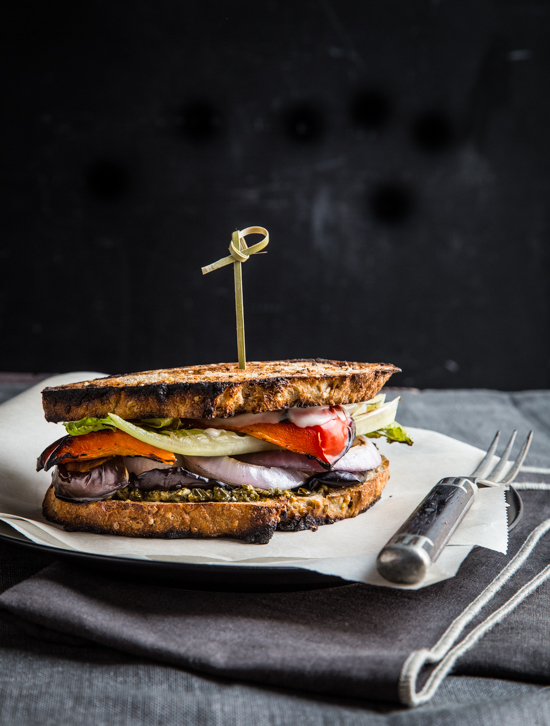 The grilled romaine and eggplant, not to mention the rustic multigrain bread, provide this sandwich with some serious staying power. Also, this entire meal is finished and ready in less than 30 minutes which makes it a dinner-time hero on a busy school night. In fact, today is the Buddy’s very first day of school and guess what we’re having for dinner? You guessed it – these sammies. Especially since we will all be headed out to Cross Country practice shortly after dinner. The nights can get so busy, but a healthy dinner has to remain a priority. The veggies might change a bit as I have red leaf lettuce and a counter overflowing with summer squash. There are two things that every veggie sandwich needs: hummus and pesto! The flavor that these two condiments impart are unbelievable. The earthy hummus and the tangy pesto are out of this world when paired with the smoky veggies. 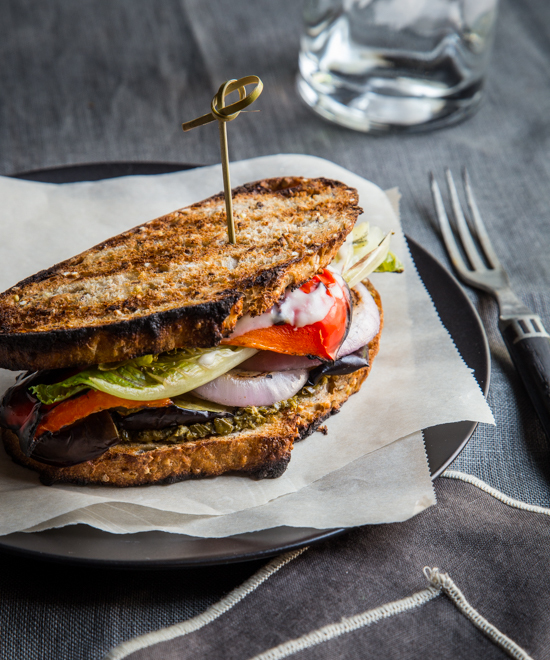 I’ve been invited by American Family Insurance to share one of our family’s favorite quick and healthy meals and these Grilled Veggie Sandwiches top the list! 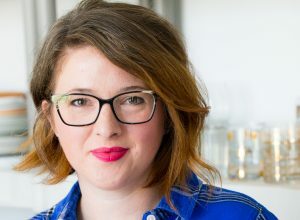 For more wonderful ideas on family activities and recipes check out American Family Insurance’s Health and Fitness #ChooseDreams Pinterest Board. You can also find and follow them here: Website, Linkedin, Youtube, Google+, Twitter, Facebook and Pinterest. Preheat grill to medium high heat. Brush veggies with olive oil and place on grill. Grill veggies until tender, but not mushy, flipping halfway through cook time. The romaine will be done quickly and the onions and peppers may need a few minutes longer. Just keep an eye on them and watch for charring. Remove veggies from the grill and keep warm. 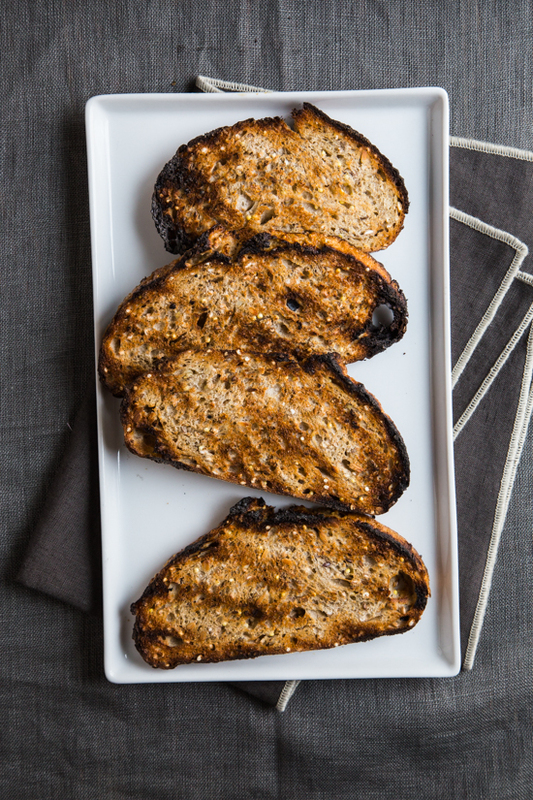 Pop the bread slices onto the grill for a quick toasting. When bread is toasted, remove from grill. Assemble the sandwiches: Spread one piece of bread with 1 tablespoon of hummus and a second piece of bread with 1 tablespoon of pesto. Layer 1/4 of the grilled veggies onto the pesto bread and top with the hummus bread. Repeat for the remaining sandwiches. Serve sandwiches warm. Enjoy! If you have a large grill, you can grill the veggies and bread at the same time. Or if you're like me and are working with a smaller grill surface, you might want to work in batches as the directions indicate. Either way, you're bound to have a fabulous sandwich!! These sandwiches were already looking good and then you topped it with hummus. Sold! Thanks so much, Heather! Grilling all of the veggies plus the bread does give the whole sandwich a great smokey flavor! Best looking veggie sandwich I’ve seen in a long time. Yum! What a lovely sandwich. All-veggie sammies are my favorite. Pinned. totally obsessing over how amazing and delicious these grilled sandwiches look. pinned! This sandwich is gorgeous Emily! I agree-we’re not done with grilling yet, and I’m still clinging to all of the summer produce. We’ll definitely be trying these soon! I LOVE grilled eggplant. . LOVE this sandwich!! Pinned and sharing! One of the prettiest veggie sandys I’ve ever seen. So rustic! 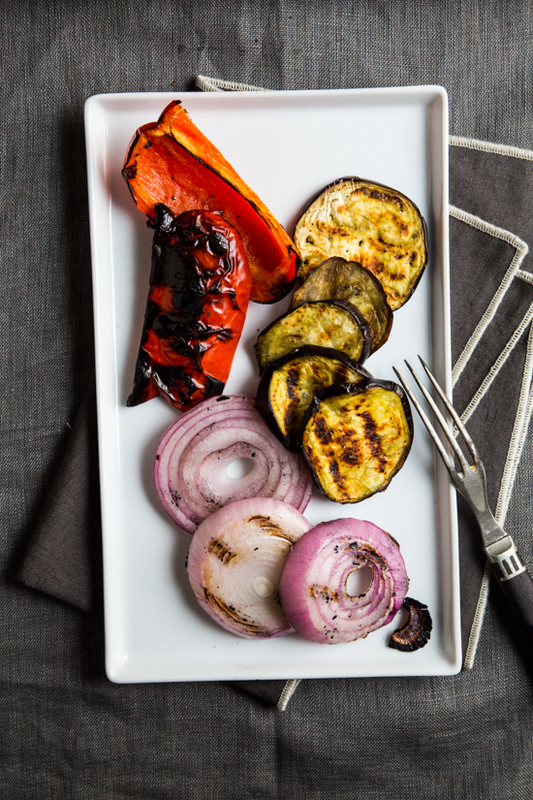 There’s just nothing like grilled food and I love the flavor and texture of grilled veggies! 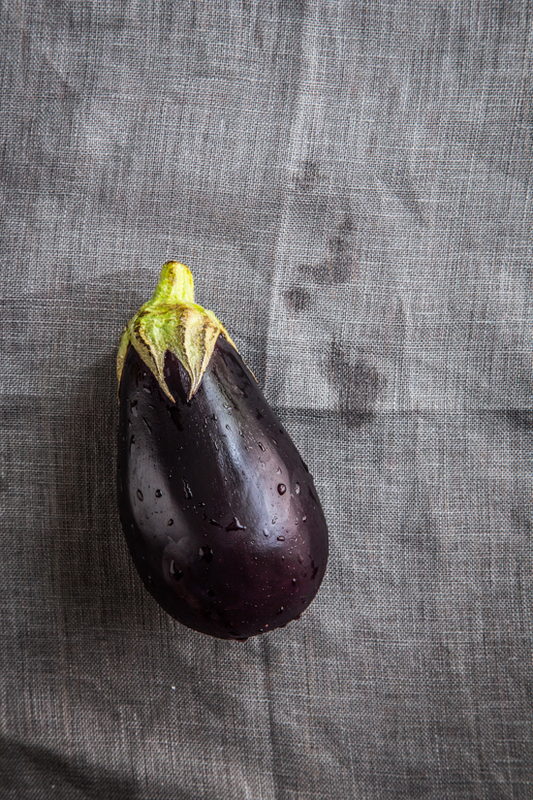 The grilled eggplant? Bring it on, sister!